Discussion in 'Announcements' started by c0wg0d, Jul 19, 2018. As you probably know, Minecraft 1.13 was recently released. If you are trying to connect to The Sandlot and get the error "Outdated server!" that means you are trying to connect using Minecraft 1.13. The Sandlot does not yet support this version of Minecraft, so you will need to change the version you use to join us. 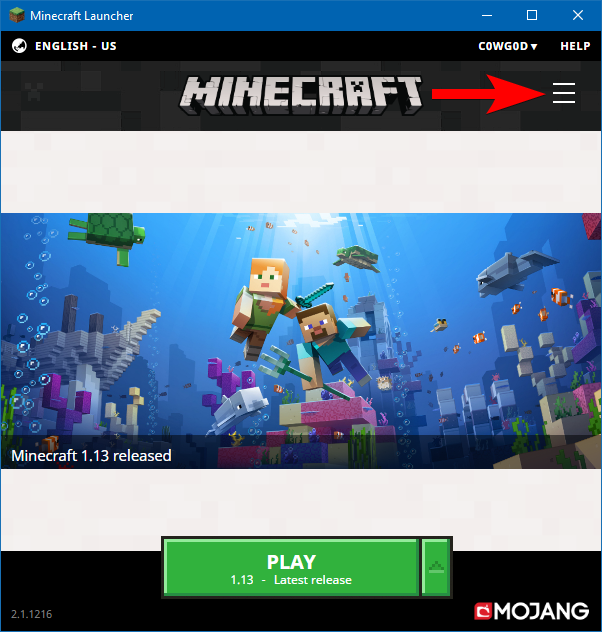 In the Minecraft launcher, open the Hamburger menu. 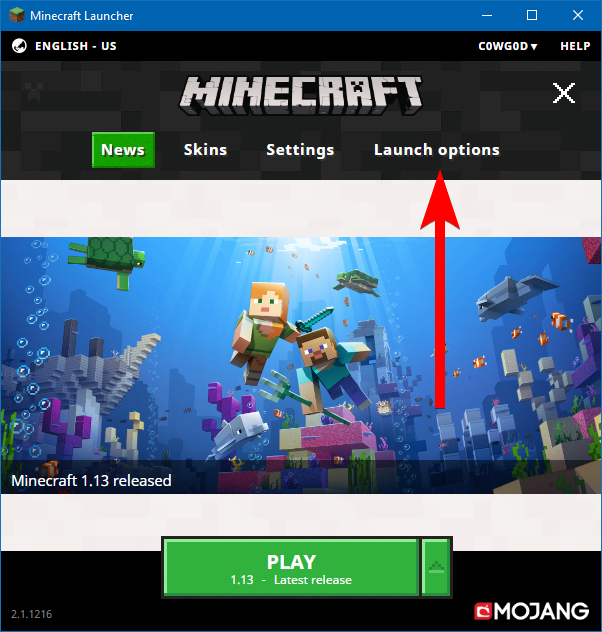 Create a new Minecraft Launcher profile. In this example, I called mine Minecraft 1.12.2, but you can call it whatever you want. You can also assign a new icon to it by clicking the furnace and selecting your desired block. 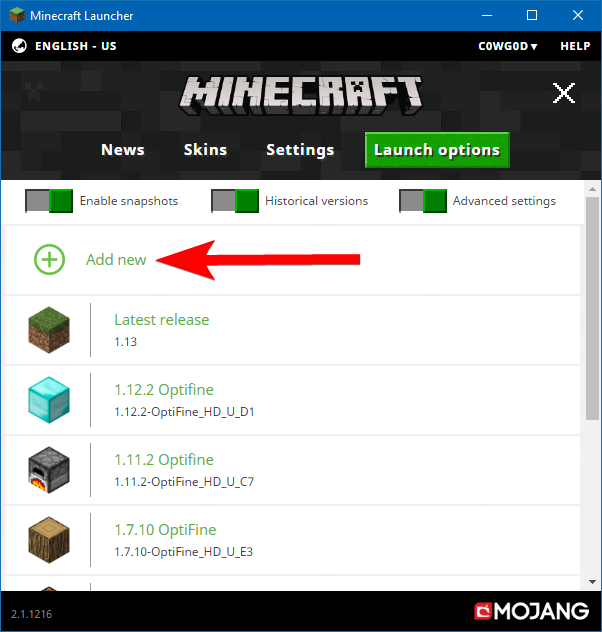 For Version, make sure you select release 1.12.2 (or your 1.12.2 optifine version if you use it, as you can see in my example). Select Save at the bottom of the page, then click News in the menu at the top. Click the triangle next to the Play button and select your new profile. Click Play and connect to The Sandlot to start playing! Some of us have this problem over and over and over. You know, a sticky in every single forum. Great job on the step by step instructions! If you like a less techy feel, you can just name that launcher profile "The Sandlot". 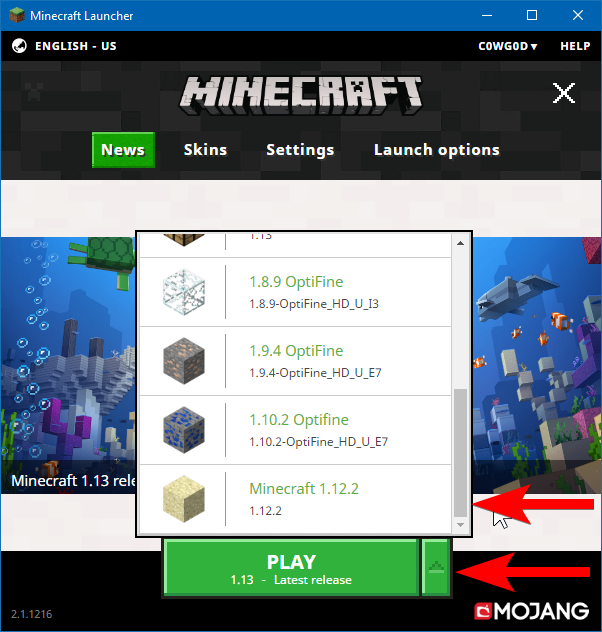 When you start Minecraft you'll have a little drop down menu to choose from and it will be really easy to spot the correct one for what you want. Mmm! Hamburger menu! Hold the pickles! Edit: Oh my goodness!! I just realized who the OP was!!! (Original Poster). ..and hamburger might not be a subject that... ...well... nevermind! Oof... I don't downgrade. I choose to leave the past in the past. I do find something odd though. Why hasn't Sandlot been able to be updated to 1.13 when another popular server, with a ton of plugins, just updated to 1.13 the day after it came out? Why hasn't Sandlot been able to be updated to 1.13 when another popular server, with a ton of plugins, just updated to 1.13 the day after it came out? Maybe they have dedicated programmers working to get everything updated and they may also create their own plugins. We have one guy who has a family and a full-time job and who uses third-party plugins (meaning he has to wait for other people to update them.) As of right now, Spigot/BungeeCord which makes the whole server even possible is not yet updated to the full 1.13 release. That's not to mention all the plugins we use. 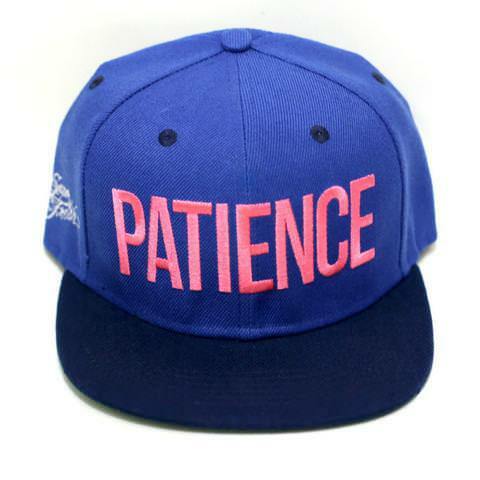 No, but I would put on your patience hat. The basic server software that Sandlot uses (Spigot/BungeeCord) is only updated to 1.13-pre-release-7 (there were 10 pre-releases.) But right now, it is really only for developers so they can work on updating their plugins; it's not yet ready for actual server use. After that's done, we still have to wait for all the key plugins we use to be updated and deemed stable. I know that it's hard waiting even more after we waited soooo long to get this update in the first place, but we don't want to push out something that is incomplete and could crash or corrupt the whole server. So while c0w and others do their work behind the curtain, the best thing the players can do to help is be patient. "Please stop asking when 1.13 builds will be ready. They will be released only when we are comfortable with the stability and completeness of 1.13-pre7. 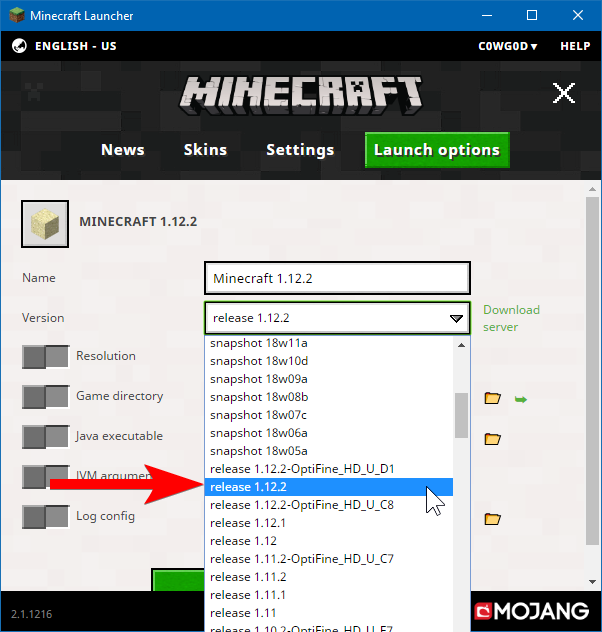 1.13 is different from any previous versions in several key aspects. As evidenced by some of the numbers above, it is the largest release of Minecraft ever, with a huge amount of changes, features, and bugs introduced. It is difficult to put an exact assessment on the scope of the changes, but a jump from 1.8 to 1.12 all at once is a fair approximation (i.e. all 4 previous updates merged together)." No, but I would put on your patience hat. What do these look like? Are they stylish? Maybe they have dedicated programmers working to get everything updated and they may also create their own plugins. We have one guy who has a family and a full-time job and who uses third-party plugins (meaning he has to wait for other people to update them.). On this note (as we remain patient): thanks @c0wg0d for running Sandlot as a labor of love in your spare time in order to keep it not only free of charge, but also free of advertising. I know that I forget that this is unusual and I don’t remember to appreciate how unique this is. Not only is Sandlot family friendly and all around awesome, but it’s free. But beyond that, we don’t have sponsor notifications interrupting play all the time, or posted on our forums. This is huge! And hey, once in a while it’s fun to go back to single player and struggle along from the beginning. I don’t maintain single player games so whenever I want to check something new out I have to start from scratch. Which is kind of fun too! Wow!! I always thought it was three lines!